Whether you’re already in the middle of it all or just about to join in, you know for sure that the sneaker culture or sneaker community is the most versatile and rich among all youth communities. The sneaker culture was not born yesterday. Nor the day before. This culture raised generations of sneakerheads, loyal and enthusiastic enough to wait in lines for long hours and nights to get the kicks they love the most. The sneaker culture or community was established long before online releases, Instagram or Twitter. It actually started between the 70s and 80s, sometime around when Hip Hop made its debut into the world. There isn’t really that one incident that created the sneaker culture, rather the increase in shared interest in basketball, hip-hop and sneakers themselves. Everyone wanted to dress like their new favorite hip-hop singers and shining NBA stars. Everyone wanted to take part of this journey. And so many sneakerheads managed to do exactly that! From the very beginning of this cult, there were 2 brands that caught the attention of sneakerheads around the world. The historic rivals Adidas and Nike managed to satisfy the deepest needs of sneaker fans, and that made those 2 names the real giants of the industry. Around the mid-80s, another name joined the game, and it was none other than Nike’s Jordan Brand. Nike managed to bring special attention to basketball, after building a whole brand around the name and achievements of Basketball superstar Michael Jordan. And on that glorious day, everyone knew that the sneaker culture will become unstoppable. Just like with any other cult, the sneaker community brings together people with the same interest. For shoes in this case. And not just any sneakers, these sneakerheads have developed a taste for originality, classics and exclusive kicks. But unlike many communities that fade away fast, the sneaker industry seems to be only growing bigger. So, what will this “Sneaker Culture” Add to your life? Tens of thousands of sneakerheads are in this together. They’re all like one big family, sharing the good, the bad and the pain of Ls. when you’re in the sneaker community, you’re never alone. You’ll always have people backing you. Whether with the latest release info, early links, or their non-expired carts, you’ll always find support here. It’s pointless to point out that this is one of the biggest advantages for you. You’ll enjoy the comfort, and high you get from flexing super-limited and hyped kicks. Another advantage that the sneaker culture offers you is money. In many cases, when the sneakers you buy are very limited and desired, you can sell them for exponentially the retail price you paid. So if you don’t like’m sell’em and make yourself some cash before the next release. Granted that you choose the right pair to cop! Some sneaker releases are worth fortunes. Collaborations, limited releases, and reinvented classics can make a sneakerhead thousands of dollars as net profit. Of course, this will not come cheap, so you can be sure you’ll need to spend a few hundreds of dollars to get to where you want. You can’t shoot hoops like MJ and you can’t sing Like Kanye West, so you might as well flex their kicks. Admit it, we all want to be someone else, a rapper, a basketball player or even an influencer on social media. And with limited resources and skills, the closest way to become them is to wear what they wear. That’s why big sneaker names like Adidas and Nike are relying more on collaborations, to market their products. And that strategy has proven its efficiency in many ways the last couple of years. So if you wanna get a step closer to the big names and celebrities, and be known for your kicks and style, the sneaker community is the place for you. Believe it or not, Sneakers are now a big part of the whole fashion industry. Big names in the world of fashion like Valentino, Comme des Garcons and Versace are now putting sneakers on models on the biggest runways in the world. And that’s no longer a weird thing because the effort put into creating sneakers cannot be taken lightly. You’ll also get all the latest gossip on celebrities, their partners, and even kids. Every sneakerhead in this blessed sneaker community follows Kim Kardashian, if not to see her, then to get the inside news on Kanye West, Yeezys, and every single unreleased pair you see online. This doesn’t by any means stop here. And as long as sneaker brands keep marketing their latest releases through celebrities, we’ll always know what Kim had for dinner last night. Never in a million years, did I think I would know what BOOST, adiPrene or even ZOOM meant. Now, I do, thanks to this sneaker community loaded with knowledgeable, almost scientists, sneakerheads. So, if you’ve been a part of this sneaker culture, or just around a sneakerhead, you’ve probably heard the words, bot, proxies, and servers. And believe me when I say, knowing how each of them works, and how to optimally get them to work together is no easy work. It takes several months, years and failures to get to that perfect result. With time, you’ll know exactly which bots are the most powerful on the market, and how they actually do it. You’ll also get the hang of proxies, servers and all the details regarding how sneaker copping works. 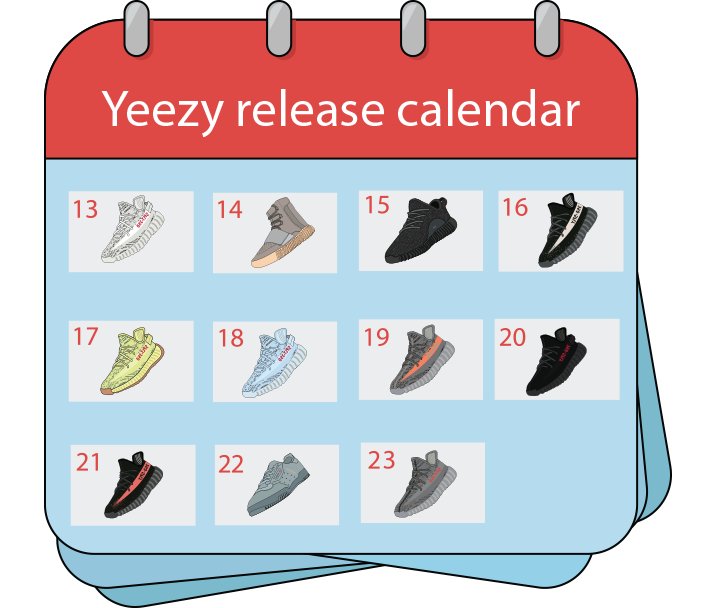 If only our moms knew how well-organized our sneaker release calendars are! During high seasons, a real sneakerhead will have it all planned and figured out. He will eat, sleep, and even blink in a timely manner. And that’s no joke! Do you know how much Yeezys cost on the resellers market? Have you seen the crazy asks on the latest NMDs? Copping sneakers is a very serious and delicate process. Every second counts, and costs. So, incredible time management skills kick-in to help us keep track of every single hyped release that’s happening. Our brains turn into web scrapping tools, that collect early links, keywords, and resale values. All in the hope of never taking an L. Or worse, paying resale. Now, wait until they see how well-kept and cleaned our sneakers are! Remember that closet you were supposed to clean 3 months ago? Of course, you don’t! But you definitely remember to keep your kicks clean, wrapped and stored in a safe, dry and non-dusty place. We get that! No one wants to pay $250 for a pair of NMDs designed by Pharrell Williams to have them touched by their nephews! so that closet is gonna have to wait. Where was this super hyper memory with the ultra expandable capacity when we needed it back in high school? Things can get a little overwhelming for a novice sneakerhead, but with time every pledge in the sneaker community will develop superpowers they never dreamed of having. Release dates, Silouhettes, Colorways, Designer Names, and every other related element will be all stored in that head of yours. And no matter how many releases are dropping in a certain period of time, you’ll have it all kept in your sneakerhead memory. Ls, OG, Retro, Deadstock, Colorway. These all sound like extra-terrestrial words for normal people. But in the sneaker culture, these words are the equivalent of the alphabet. The Sneaker Culture has its own terminology, and you’re not indoctrinated into this cult unless you know it all. By heart! Well, anyone can relate to this issue here. Do you remember how ignorant and stupid you felt in geography classes? Now, thanks to the sneaker community, everyone involved knows exactly where every country is located. Not only that, we can mentally calculate international time zones and can recite the major cities of each country like they’re our names. You can go through so many ups and downs when you join the sneaker culture. But beware that once you’re in you’re probably not getting out. At least not with the same mindset. You’ll always have a thing for sneakers, and will always stare at strangers’ feet everywhere you go. And most of all, you will forever roast people for wearing fakes.